Enid Mumford noted that the difference between competence and capability lay in the difference between attenuation and amplification between complex systems. Competence involved the attenuation of an environment to fit the acceptable parameters of an individual who had learnt a set number of appropriate responses. Capability involved the production of multiple descriptions of understanding of a complex situation such that a solution to a new situation may be creatively generated rather than retrieved from memory. Teachback goes as follows: the teacher says of the student (or ‘subject’) that the student understands a topic to the extent that he can teach it back to the teacher. This is, understanding is inferred if the student can furnish an explanation of the previously discussed topic and can also explain why he gave that explanation of how he constructed it. The crucial point is that the student’s explanation and the teacher’s explanation need not be, and usually are not, identical. The student invents an explanation of his own and justifies it by an explanation of how he arrived at it (in fact an identical explanation is generally rejected unless the student can give a reason why the teacher’s explanation was particularly good). the resilience of a memory will depend upon the number of explanations produced in teachback; for example, that a student impelled to give many explanations will fare better at session 2 than a student required to give only one. He has many ways of reconstructing a concept and this redundancy will combat the effect of interfering and incompatible learning experiences during the intervening week. 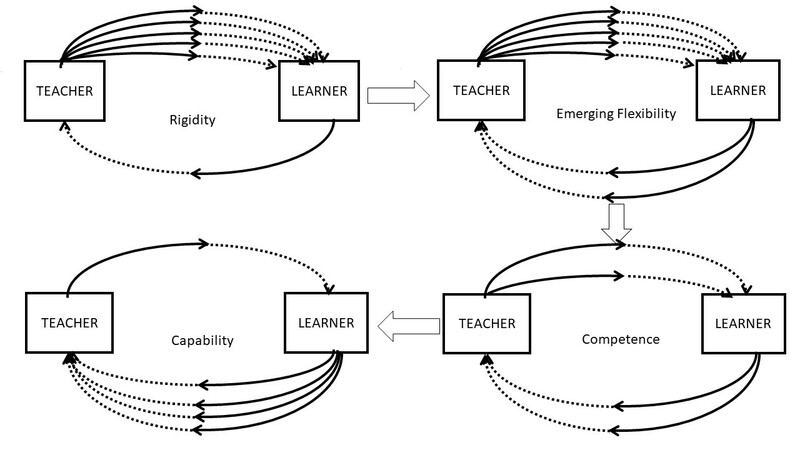 What this suggests is that redundancy is the principal indicator of learning, not information. In Shannon information theory (which underpinned Pask's thinking), redundancy is the inverse of information: it is the context within which messages are formed. Education is not about the message; it is about the context! At the stage of "rigidity", the teacher present many alternative descriptions of what they are trying to convey (this is generally what teachers do!). The learner is only able to reproduce one of the descriptions they are given, if that. Gradually, they acquire greater flexibility to utter more descriptions. Having two descriptions of the same thing is very powerful, and builds towards a generative capacity to create (or guess) other explanations. Then there comes a stage when the learner is able to respond to the different descriptions of the teacher with effective matching alternative descriptions. At this point, we might say that the learner is competent. Finally, the true generative power of the learner's understanding is revealed at the stage where from a simple prompt by the teacher, the learner is able to generate all manner of descriptions - some of which may not have been conceived by the teacher. At this stage, we can say that they are capable, confident and adaptable in their knowledge. What happens from stage 1 to stage 4 is a gradually awakening to the constraint which lie behind the teacher's generation of their own descriptions. 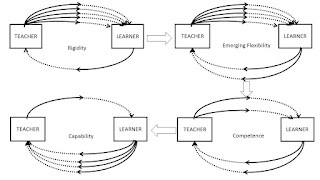 By the end, what the learner has learnt are not facts, but the mechanisms of transduction within the teacher whereby the teacher is able to generate the descriptions and skilled performances that they demonstrate. If only we'd thought of this when people sent their students off with their dreadful e-portfolio systems, we would have done it all very differently! When is a musical note a different note?